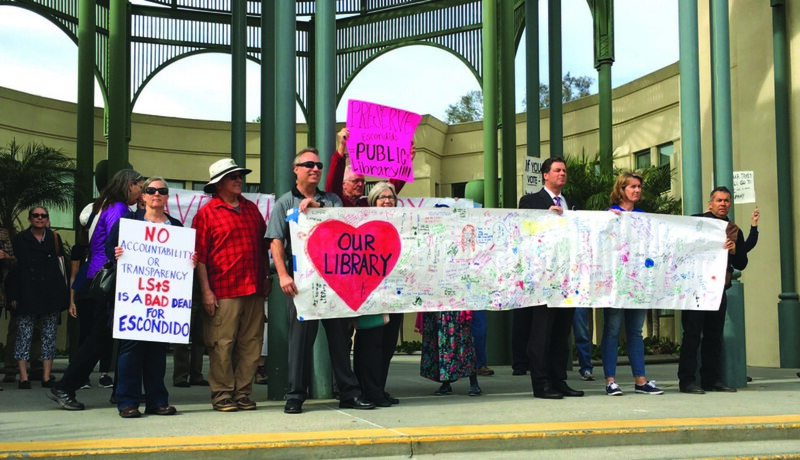 ESCONDIDO — Dozens of supporters rallied at the city’s public library and marched to City Hall on Nov. 28 to protest the decision by the City Council to privatize the facility. San Diego-based consumer attorney Alan Geraci served the city papers and filed a lawsuit in the Vista Superior Court challenging the council’s Oct. 18 decision enter a 10-year agreement for Maryland-based Library Systems & Services to operate the library. LS&S operates 20 library systems in 80 states, according to its website, and will take over operations on Dec. 18. The council voted 4-1, with Olga Diaz against, to privatize the library saying it can’t afford to cover pensions through CalPers. Employees of the library will be offered to keep their positions, although Geraci said it comes with pay cuts, reduced benefits and no pensions. 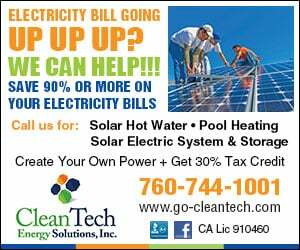 Mary and Roy Garrett, who have lived in Escondido for 48 years and have been vociferous in their opposition, hired Geraci. Roy Garrett, a former attorney, is a staunch supporter of the library and railed against the council for adopting the measure to outsource the operations. The Garretts joined the Save Our Escondido Library coalition, spearheaded by Debbie Resler, to fight back against the decision. Resler blasted the council for not accepting any other bids for the contract and ignoring a request for a budget proposal, the trustees’ unanimous vote against outsourcing and 4,000 signatures on a petition against the agreement. Geraci said one of the arguments is around the Library board of trustees, which operates the facility and is supposed to take out the politics. This is the first library in San Diego County to be privatized, although LS&S operates a facility in Riverside County. “By being operated and managed by a board of trustees, the community is ensured that the knowledge and information contained in the library is safe and secure and beyond the reach of politics,” he added. John Donel, a senior research librarian, submitted his resignation last week in protest and chided the council and said he was disheartened the council opted to politicize the library and subvert the First Amendment. The majority of the council praised the contract where the Library board of trustees and the city can request changes into scope of services. Additionally, the board of trustees will be involved with the management and decisions about what books are purchased. Mayor Sam Abed, meanwhile, said the council is trying to make the library sustainable for the next 10 years. As for the pension, Abed said if it is capped for the 38 employees, it will cost $1 million per year and if the status quo remains, it will run more than $2 million.